This apparatus is used to determine G by measuring the time of fall of a steel ball through a pre- determined distance.. The time taken being less than one second, a centi second/ milli second timer capable of measuring the time in fraction of seconds has to be used. Comprises two units each of which is mounted on a plastic which can be clamped on a 12 mm diameter retort rod. Connections are taken out to 4 mm sockets. The solenoid unit has a metal core which facilitates prompt release of the sphere on de-energizing. The gate switch comprises a hinged steel plate to hold against an adjustable contact by means of a small permanent magnet, the plate falls away promptly at the impact of falling steel ball. The apparatus is supplied with a solenoid unit, gate switch, Steel Ball 18 mm dia and a stand. 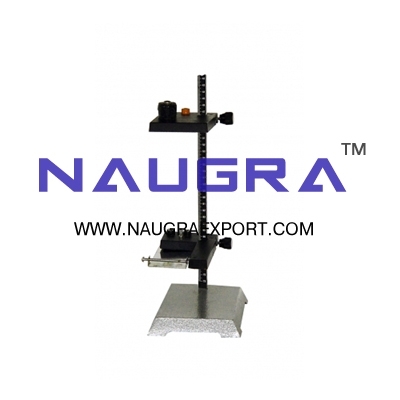 We are leading manufacturers, suppliers & exporters of Free Fall Apparatus for Physics Lab. Contact us to get high quality designed Free Fall Apparatus for Physics Lab for schools, colleges, universities, research labs, laboratories and various industries. We accept bulk orders for government tenders in all countries around the globe. For similar products visit at main page of Mechanics Physics Labware.